Toy stories and movies call it "slime" or "ooze", but this goopy substance is actually a great introduction to polymers for your science class! Students will delve into an overview over the kinds, uses, and examples of polymers, their disposal, and biodegradability. Then your students get real "hands-in" experience of just what polymers are, using two non-toxic chemicals to make slime. 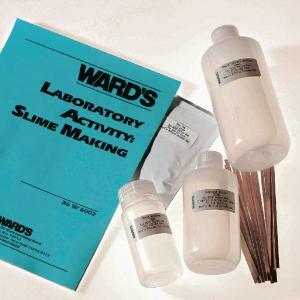 Ordering information: Includes Guar Gum, Borax Solution, Food Coloring, Pipettes, Beakers, and Wooden Stirrers.